Why is the Belial considered a 4th-generation Arm Slave? Why is the Plan-1055 Belial considered a 4th generation Arm Slave while the Plan-1056 Codarl and Plan-1058 Codarl-i Arm Slaves, which were developed from it, considered 3rd generation Arm Slaves? The suit is considered a fourth generation suit, making it more powerful that the Arbalest, even with its Lambda Driver installed. Despite all these advantages the suit has no visible weapons, leaving only its bare hands and the Lambda Driver to destroy its opponents. However, the use of the Lambda Driver is pivotally its greatest strength and its greatest weakness. The reliance that the suit has on the Lambda Driver, and not on normal weapons, is a dangerous flaw in its design. The suit needs the Lambda Driver if it is to fly like it does and if anything happens to the device or the wings then that ability is gone. The other weakness is Leonard’s own arrogant attitude towards Sousuke. 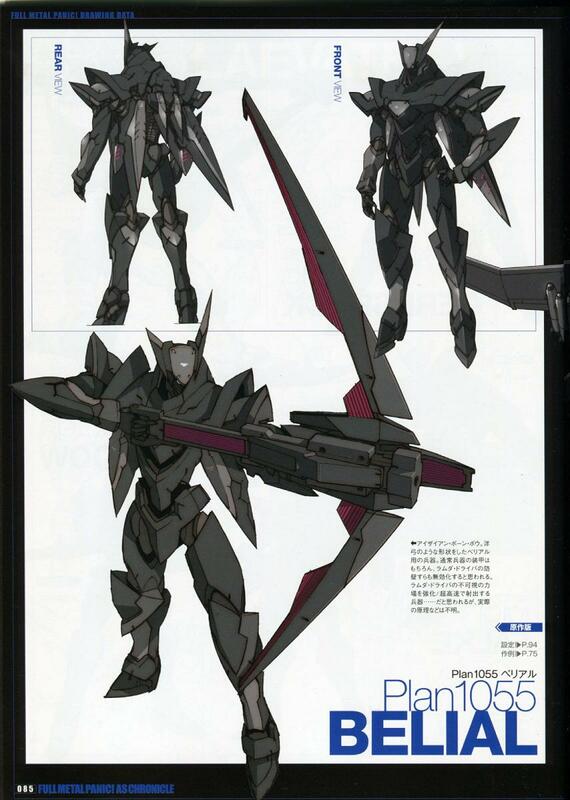 Leonard never expected Sousuke to acquire a suit to match the strength of Belial until the ARX-8 makes its debut. The Plan 1056 had an overheating problem that was fixed in the Arm Slave Plan 1058, when they installed an improved heat sink on it. What makes the Plan 1055 a 4th Gen suit is that the Lambda Driver that it uses and the capacity to fly, this means that the Lambda Driver and the features added to this model are far beyond updated than the versions Plan 1056 and Plan 1058. Gundam: Pretty much any time a mass-produced suit is made based off of a gundam, it is FAR less powerful, because the proceeding gundam was much more expensive. Super Robot Wars: The original Huckbein was much more powerful than the following Huckbein Mk. II, and the Mk. II 009. But the original was also inherently more dangerous due to it's black hole engine, and too expensive for full production. (also, the Huckbein Mk. II M version (mass produced) was less powerful than either the Mk. II or the Mk. II 009). It wasn't until the Huckbein Mk. III that the line began to overtake the original. Also, the "titular" suit, the SR-X, is too expensive, and thus it was never mass-produced. The component mechs were too expensive as well, so instead of mass-producing the R1, they developed the R-blade (a watered down version of the R1). How was Amalgam planning to achieve their ultimate goal?